Saturn’s rings do more than just look pretty. New data from the Cassini-Huygens spacecraft orbiting the planet shows their shadow can actually change the planet’s atmosphere. The new research from scientists in Sweden and the United States demonstrates a clear difference between the particles in the Northern and Southern parts of the planet’s ionosphere, its electrically charged upper layer. But the star of the paper is Cassini. The probe is continuing to deliver, even three months after plummeting into the planet. Scientists define the “surface” of Saturn, a gas giant, as the place where its pressure equals one bar—a little less than the average pressure at sea level, 60,268 kilometers (37,550 miles) from its center. The ionosphere begins around 300 kilometers (186 miles) up and goes way out to 5,000 kilometers (3,100 miles) up. Earth’s ionosphere goes from 60 kilometers (37 miles) to 1,000 kilometers (620 miles) up and its radius is around 6,400 kilometers (3,980 miles), for comparison. This region is populated by particles that have been ionized, or become charged by losing electrons thanks to the Sun’s radiation. 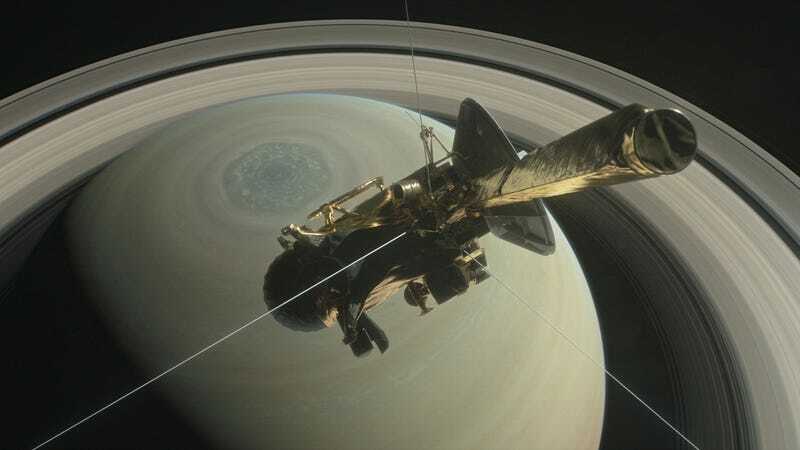 Cassini entered Saturn’s ionosphere on April 27th of this year and began orbiting, during which scientists were able to collect data with its Radio and Plasma Wave Science (RPWS) instrument package. Aside from measuring the density of electrons and ionized particles, it found that the A and B rings were causing noticeable dips in the amount of ionization in the Southern portion of the ionosphere. The scientists published the results today in the journal Science and discussed them today at the American Geophysical Union’s Fall meeting in New Orleans. These results are important for the way they can help explain how particles move around the planet and its atmosphere—information we could perhaps extrapolate to other gas giants. You can bet there’s a whole lot more data that the scientists need to analyze to fully understand the planet’s atmosphere. Kurth cautioned that these results relied on only one of the probe’s instruments and the first 11 of many orbits, nor do the results use data from the probe’s final plunge. This data is the capstone of many years of important science from the mission, said Kurth.